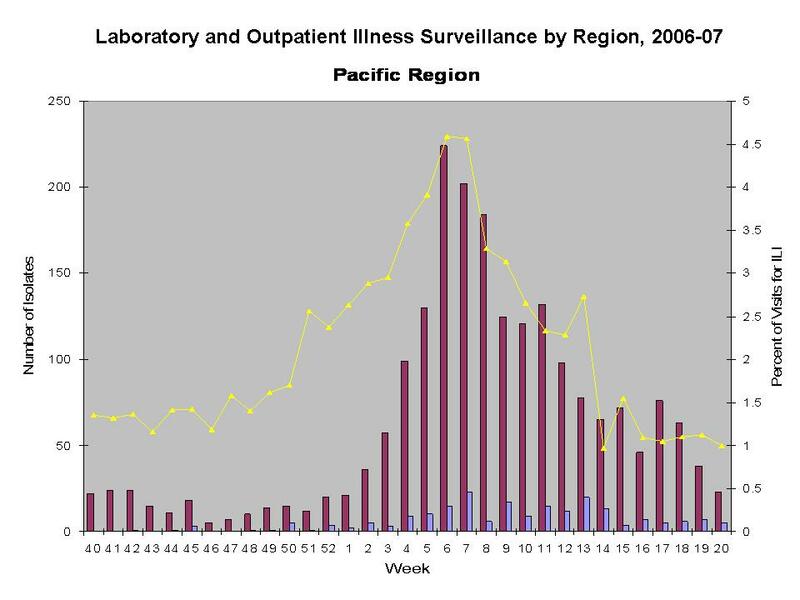 During the 2006-07 season, influenza A (H1) viruses were most commonly isolated, but influenza A (H3) viruses were more frequently identified than influenza A (H1) viruses from early March through May. A small number of influenza B viruses were also identified. Nationally, low levels of influenza activity were reported during October through mid-December, increased during January, and peaked in mid-February. To date, no cases of avian influenza A (H5N1) virus infection have been identified in the United States. However, during the 2006-07 season, outbreaks of highly pathogenic avian influenza A (H5N1) among poultry and isolated human cases were reported from countries in Asia. In collaboration with local and state health departments, the Centers for Disease Control and Prevention (CDC) continues to recommend enhanced surveillance for possible influenza A (H5N1) infection among travelers with severe unexplained respiratory illness returning from influenza A (H5N1)-affected countries. During October 1, 2006--May 19, 2007, World Health Organization (WHO) and National Respiratory and Enteric Virus Surveillance System (NREVSS) collaborating laboratories in the United States tested 179,268 specimens for influenza viruses; 23,753 (13.2%) were positive. Of these, 18,817 (79.2%) were influenza A viruses and 4,936 (20.8%) were influenza B viruses. Among the influenza A viruses, 6,280 (33.4%) were subtyped; 3,912 (62.3%) were influenza A (H1) viruses and 2,368 (37.7%) were influenza A (H3) viruses. 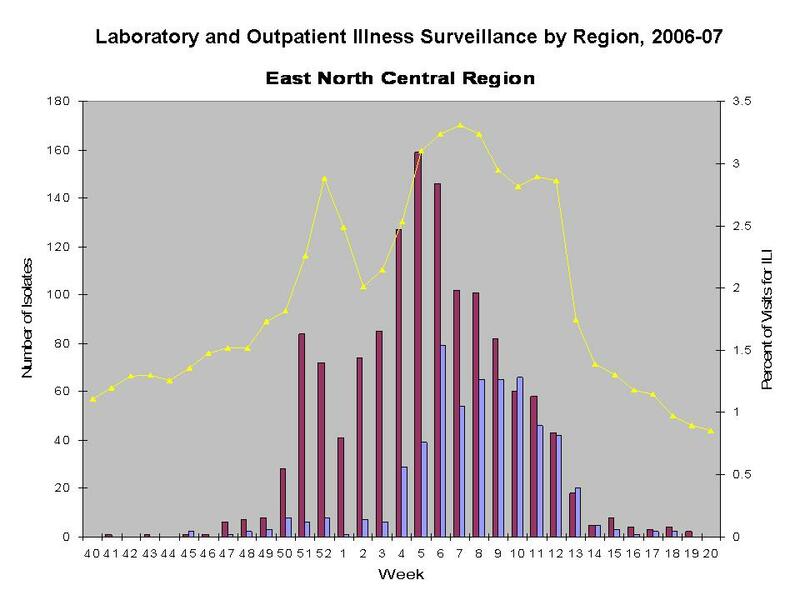 The proportion of specimens testing positive for influenza first exceeded 10% during the week ending December 23, 2006 (week 51), peaked at 28.0% during the week ending February 10, 2007 (week 6), and declined to <10% during the week ending April 28, 2007 (week 17). Fourteen consecutive weeks were above 10% positive. The peak percentage of specimens testing positive for influenza during the previous three seasons has ranged from 22.6% to 34.7% and occurred during early December to early March. During the previous three influenza seasons, the number of consecutive weeks during which more than 10% of specimens tested positive for influenza has ranged from 13 to 17 weeks. Timing of peak activity varied across the nine surveillance regions. 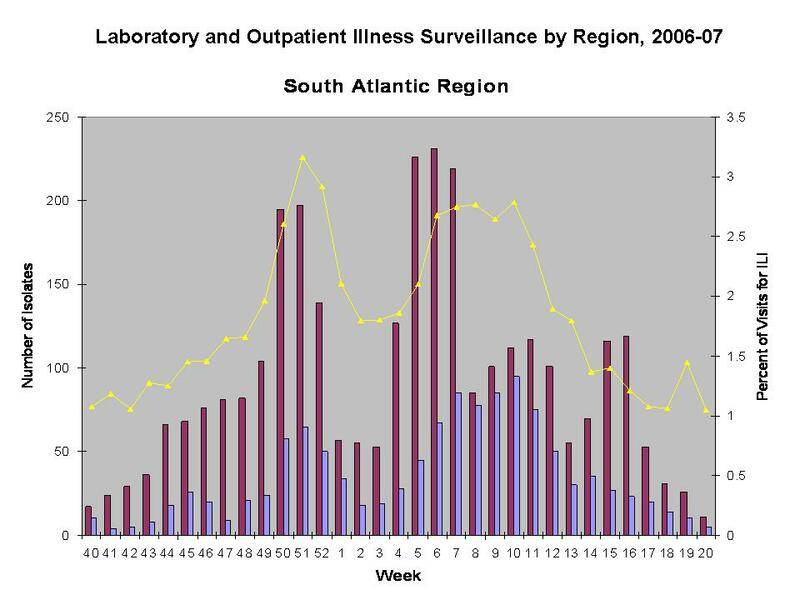 In the eastern regions (East North Central, South Atlantic, and East South Central) peaks of Influenza A were seen in late December and February. 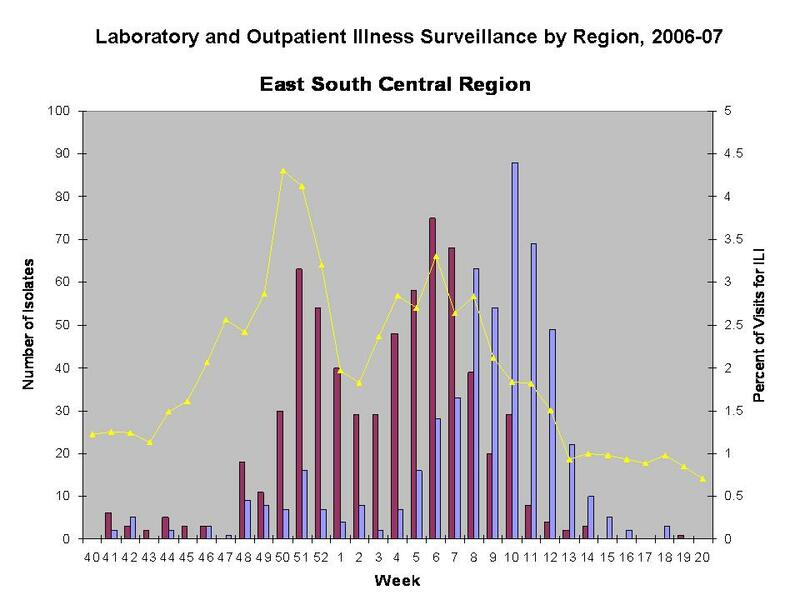 Influenza B in these regions rose in early March and predominated in the East South Central region through late March. 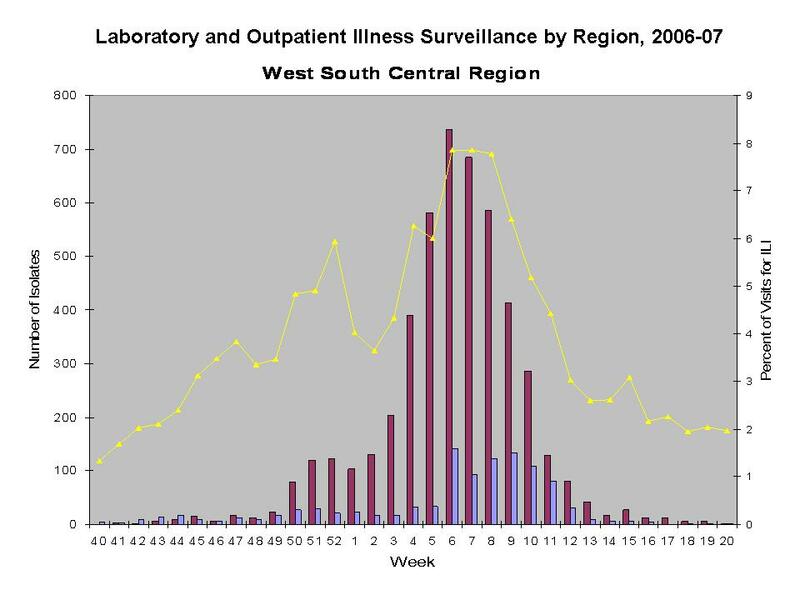 In the central regions (West North Central and West South Central) one peak in influenza A activity was seen in mid-February. In the western and northeastern regions (Pacific, Mountain, New England and Mid-Atlantic) influenza A activity peaked in early to mid-February and extended through March. 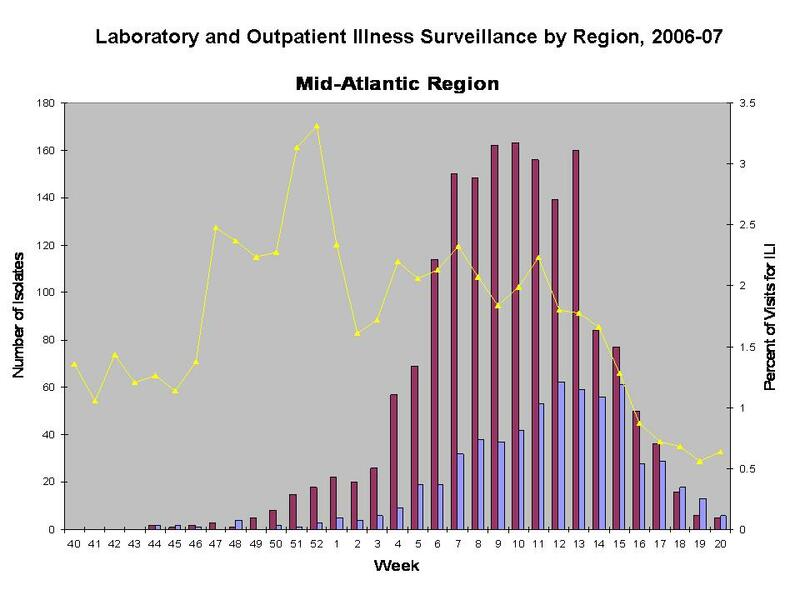 Influenza B activity notably increased in the Mid-Atlantic region from late March to early April. Since October 1, 2006, CDC antigenically characterized 1,107 influenza viruses collected by U.S. laboratories: 486 influenza A (H1) viruses, 289 influenza A (H3) viruses, and 332 influenza B viruses. Of the 486 influenza A (H1) viruses, 439 (90%) were characterized as similar to A/New Caledonia/20/99, the influenza A (H1) component recommended for the 2006-07 influenza vaccine. Forty-five (9%) viruses showed reduced titers with antisera produced against A/New Caledonia/20/99 and are similar to A/Solomon Islands/3/2006, which is a recent antigenic variant of A/New Caledonia/20/99, and is the influenza A (H1) component recommended in the 2007-08 influenza vaccine. Two influenza A (H1) viruses showed reduced titers with antisera produced against both A/New Caledonia/20/99 and A/Solomon Islands/3/2006. Of the 289 influenza A (H3) viruses, 69 (24%) were characterized as similar to A/Wisconsin/67/2005, the H3N2 component of the 2006-2007 and 2007-08 vaccine. Two hundred and twenty (76%) of the 289 viruses showed reduced titers with antisera produced against A/Wisconsin/67/2005. Influenza B viruses currently circulating can be divided into two antigenically distinct lineages represented by B/Yamagata/16/88 and B/Victoria/02/87 viruses. Two hundred and fifty-four (77%) of the 332 influenza B viruses that have been characterized belong to the B/Victoria lineage: 128 (50%) were similar to B/Ohio/01/2005, and 126 (50%) showed reduced titers with antisera produced against B/Ohio/01/2005. B/Ohio/01/2005 is antigenically equivalent to B/Malaysia/2506/2004, the recommended influenza B component for the 2006-2007 and 2007-08 influenza vaccine. Seventy-eight (23%) of the 332 influenza B viruses were identified as belonging to the B/Yamagata lineage. One case of human infection with swine influenza virus was reported in a child from Iowa in November 2006. Although human infection with swine influenza is uncommon, sporadic cases occur in many years, usually among persons in direct contact with ill pigs or who have been in places where pigs might have been present (e.g. agricultural fairs, farms, or petting zoos). The sporadic cases identified in recent years have not resulted in sustained human-to-human transmission or community outbreaks. Nonetheless, when sporadic cases are identified, CDC recommends thorough investigations to evaluate the extent of the outbreaks and possible human to human transmission as transmission patterns may change with changes in swine influenza viruses. The Food and Drug Administration’s Vaccines and Related Biological Products Advisory Committee recommended that the 2007-08 trivalent influenza vaccine for the United States contain A/Solomon Islands/3/2006-like (H1N1), A/Wisconsin/67/2005-like (H3N2), and B/Malaysia/2506/2004-like viruses. This represents a change only in the influenza A (H1N1) component. A/Solomon Islands/3/2006 is a recent antigenic variant of the 2006-07 vaccine strain A/New Caledonia/20/99. The influenza A (H3N2) and influenza B components remain the same. These recommendations were based on antigenic analyses of recently isolated influenza viruses, epidemiologic data, post-vaccination serologic studies in humans, and the availability of candidate vaccine strains and reagents. The proportion of deaths in the United States attributed to pneumonia and influenza (P&I) as reported by the 122 Cities Mortality Reporting System peaked three times, once at 7.5% during the week ending January 20, 2007 (week 3), once at 7.7% during the week ending February 24, 2007 (week 8), and again at 7.5% during the week ending March 24, 2007 (week 12), but did not exceed the epidemic threshold¶. During the previous three influenza seasons, the peak percentage of P&I deaths has ranged from 7.8% to 10.4%, and the total number of weeks above the epidemic threshold has ranged from 1 to 16. As of August 6, 2007, among persons aged <18 years, a total of 68 deaths associated with influenza infections occurring during October 1, 2006-May 19, 2007, were reported to CDC. These deaths were reported from 26 states (Alabama, Alaska, Arizona, California, Colorado, Connecticut, Florida, Georgia, Illinois, Indiana, Kansas, Louisiana, Minnesota, North Carolina, Nebraska, Nevada, New Mexico, New York, Ohio, Oklahoma, South Dakota, Tennessee, Texas, Virginia, Washington, and Wisconsin), Chicago, and New York City. All patients had laboratory-confirmed influenza virus infection. Age-specific information was available on all 68 cases. Of these, 10 were <6 months, 10 were 6-23 months, 9 were 2-4 years, and 39 were 5-17 years of age. Of the 63 cases for which the influenza virus type was known, 47 were influenza A and 16 were influenza B viruses. Of the 53 cases 6 months of age and older for whom the vaccination status was known, 50 (94%) were not vaccinated against influenza. Influenza-associated pediatric mortality was first made a nationally notifiable condition for the 2004-05 influenza season. 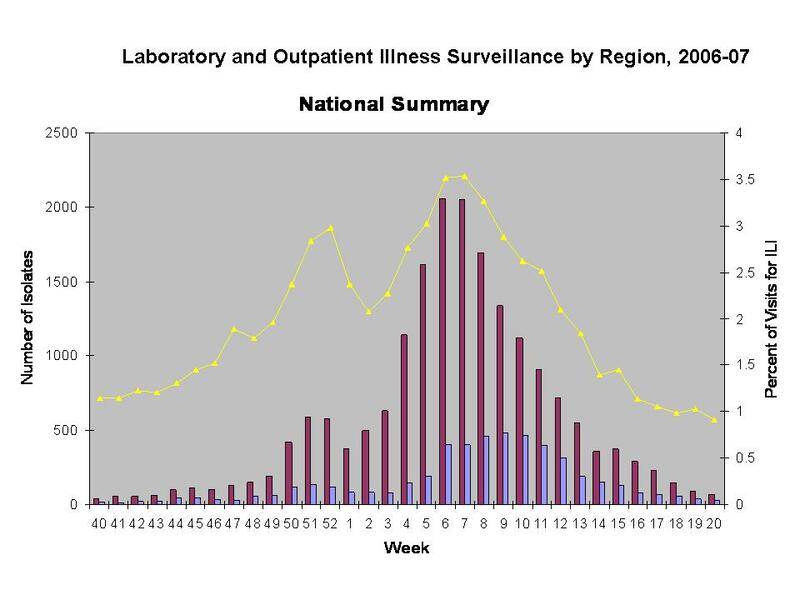 Pediatric hospitalizations associated with laboratory-confirmed influenza infections are monitored in two population-based surveillance networks‡: the Emerging Infections Program (EIP) and the New Vaccine Surveillance Network (NVSN). During October 1, 2006–April 28, 2007, the preliminary influenza-associated hospitalization rate reported by EIP for children aged 0-17 years was 0.81 per 10,000. For children aged 0-4 years and 5-17 years, the rate was 1.62 per 10,000 and 0.23 per 10,000, respectively. During November 5, 2006–May 26, 2007, the preliminary laboratory-confirmed influenza-associated hospitalization rate for children aged 0-4 years in NVSN was 3.46 per 10,000. EIP hospitalization data collection ended on April 28, 2007, while NVSN hospitalization data collection ended on May 26, 2007. Rate estimates are preliminary and may continue to change as data are finalized. During October 1, 2006 to April 28, 2007, the preliminary laboratory-confirmed influenza-associated hospitalization rate reported by the EIP for children 0–17 years old was 0.81 per 10,000. For children aged 0-4 years and 5-17 years, the rate was 1.62 per 10,000 and 0.23 per 10,000, respectively. The weekly percentage of patient visits to U.S. sentinel providers for ILI exceeded or was at baseline levels (2.1%)** during the weeks ending December 16, 2006–March 24, 2007 (weeks 50-12) and peaked twice, once at 3.0% for the week ending December 30, 2006 (week 52), and again at 3.5% for the week ending February 17, 2007 (week 7). The increase in the percentage of patient visits for ILI during the week ending December 30, 2006 (week 52) might have been influenced by a reduction in routine health-care visits during the holiday season, as has occurred in previous seasons. 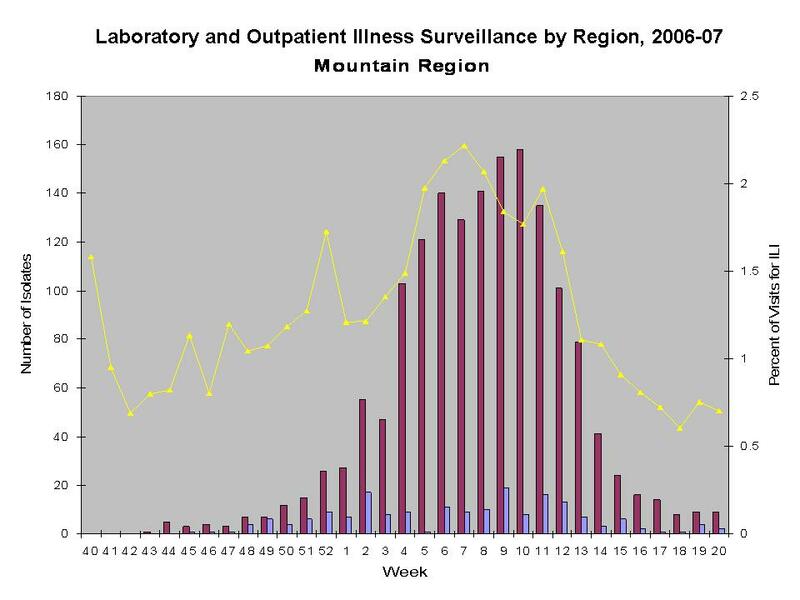 During the previous three influenza seasons, the peak percentage of patient visits for ILI has ranged from 3.3% to 7.6% and the peak occurred during late December to mid-February. Regional variations in timing of peak ILI activity mirrored what was seen in the virologic data: earlier (late December) in the southeastern portion of the United States and later (February) in the middle and western regions. The peak percentage of patient visits for ILI in the nine surveillance regions¥¥ ranged from 2.0% to 7.9%. The number of weeks above region specific baselines ranged from two weeks in the Mid-Atlantic region to 21 weeks in the West South Central region, with the other seven regions reporting between 5 and 14 weeks above baseline. ILI was at or above the national baseline of 2.1% for 15 weeks. State and territorial epidemiologists report the geographic distribution of influenza in their state through a weekly influenza activity code. The geographic distribution of influenza activity peaked during the week ending February 24, 2007 (week 8), when 25 states reported widespread activity and 19 states reported regional activity. 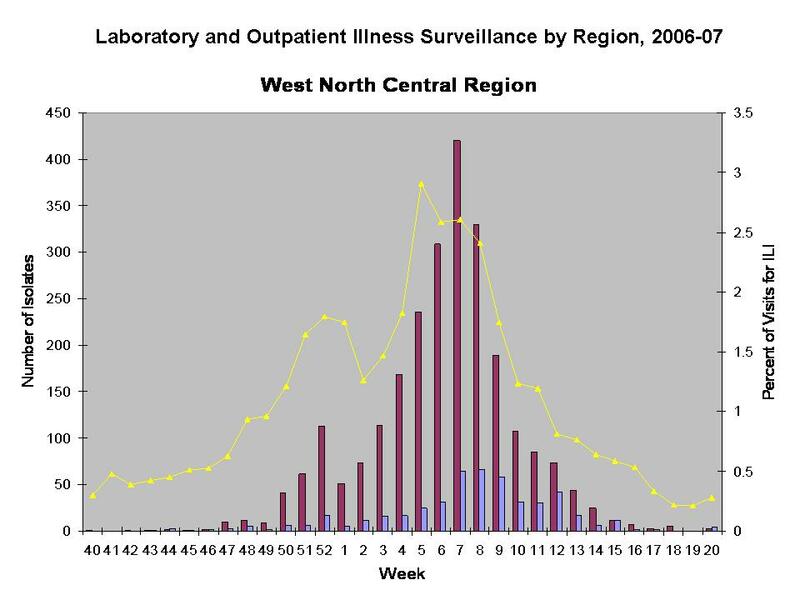 Forty-one states reported widespread influenza activity at least once during the 2006-07 season. 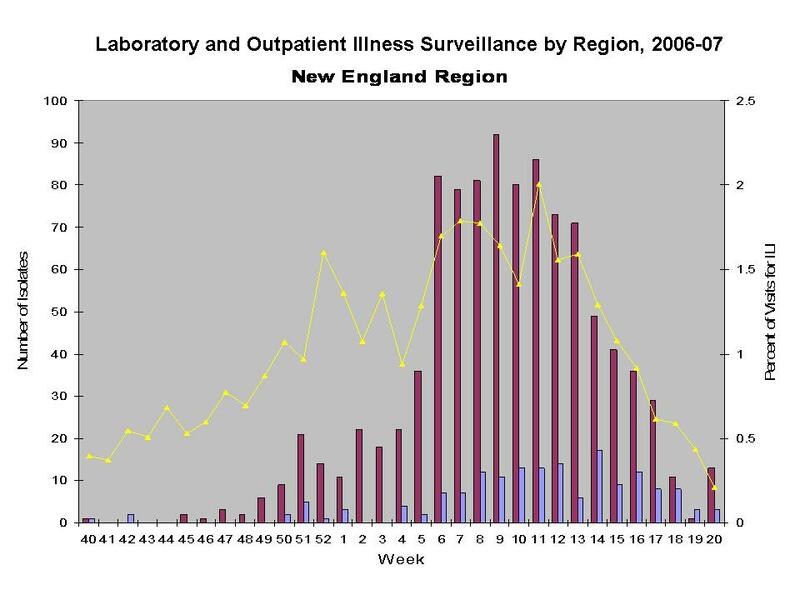 No states reported widespread influenza activity during the weeks ending April 21–May 19, 2007 (weeks 16-20). The peak number of states reporting widespread or regional activity during the previous three seasons has ranged from 41 to 50 states. For additional information on the 2006-2007 influenza season please see the season summary MMWR (Update: Influenza Activity --- United States and Worldwide, 2006--07 Season, and Composition of the 2007--08 Influenza Vaccine. MMWR Morb Mortal Wkly Rep. 2007 August 10;56(31):789-794).